The word picture painted by Jesus is of two men and two houses, in one locale, undergoing one storm. It points to the differences and similarities of people regarding faith. The illustration is given to help us distinguish between the genuine and the disingenuous—the true from the false. 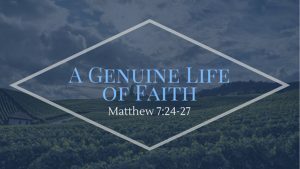 We often believe that we will easily be able to detect what is false around us, but Jesus warns that it is not easy to distinguish the false from the true. Looking at the similarities and the differences of the men and houses in Jesus’ illustration is meant to help us to observe the genuinely saved and the unsaved, the Christian and the pseudo-Christian. The similarities of the men are evident in their desires and in some of their ways of construction. The differences are evident only when the storm comes. When the failure is evident, it is too late to do anything about it. Jesus helps us to realize, before it is too late, that our spiritual foundation may be faulty. Embraces a cheap gospel without self-denial and holiness. Is given to the desires of the flesh rather than being given to the sanctified life of Christ. Although he may hear the word of God, he often does not do it. He chooses to remain in sin, assuming that God’s grace will cover his sinfulness. He ignores the fact that a day of judgment is coming (Matthew 7:21). Disciplined to remove faulty material to build on the solid rock. With poverty of spirit, he confesses and repents of sin, building life on Jesus and his word. Delays immediate temporary gratification for future lasting gratification. Chooses eternal purity over gratifying immediate fleshly desires. Diligent to listen to and heed wise counsel. Discerning of his ways and practices. Hungering and thirsting for righteousness, he chooses holy living. Prudent and purposeful to live disciplined with eternity in mind. Like the two builders in Jesus’ illustration, you find Christians and pseudo-Christians in the same place, often appearing alike in attendance and ministry. There are people here now who have built life on something other than Christ Jesus and his word. We may see a façade of attendance and ministry, but God looks beneath, to the foundation or lack thereof. The 12 disciples appeared to be the same, but one of them collapsed. Judas Iscariot’s life without foundation was exposed, and he and everything he built in life tumbled down. What is your greatest desire, the evidence of what you hunger for the most? When you rise tomorrow morning, what is it that you hope to accomplish? What will be your purpose and intention for the day? Do you long for the peace of God, the love of God, the forgiveness of God, the joy of God and the blessings of God without longing for God himself? Do you cling to the promises of God while not being given to the purposes of God? Your truthful response to those questions could reveal a foundation of obedience to God’s word in your life or reveal life without genuine foundation. The genuinely saved have a bedrock of faith and desire to do the will of God. 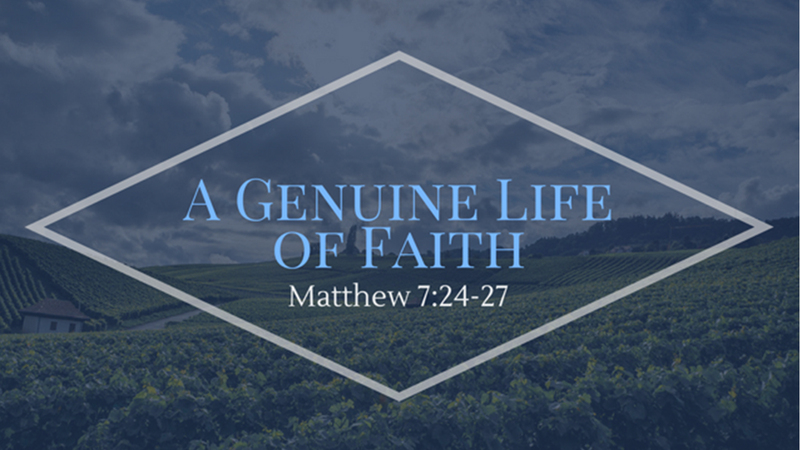 Jesus warns us to not be fooled by building a beautiful life, but failing to build life without a solid foundation of faith and surrender to God and his word. Life giving faith is always evident in life.